It is Tyler's spring break. He got an extended break when we got a snow storm Thursday which closed school two days. Thursday was Tyler's first snow day ever. Friday was his second. That is sort of amazing considering we live in a place like Denver as opposed to a place like Nevada (for example). We went to Las Vegas for Tyler's spring break. Well, Henderson, NV actually, but we can see the strip from the place that we are staying. My wife's mom and dad live here in the desert. I cannot imagine living here. I hate the summer in the desert and don't really like the fact that you don't really have a winter here. Actually, I think I am one of the few people in the world who probably would not visit Vegas (unless I had relatives living here and/or my wife made me come). It just is not someplace that excites me that much. But the kids really like visiting their grandparents. And the weather this time of year is ok.
We drove this year. Utah has some interesting scenery and we have not taken our mini-van on a long road trip yet. Plus, I was sort of hoping we would get one of our huge snow storm and not have to go. We got a huge snow storm, but not big enough to stop the trip. Oh well. On the ride out, we stopped at one of those Utah viewing areas and Tyler found this little lizard running around across the rocks. Tyler did a good job picking the guy out considering how well he was camouflaged. Anyway, we are having fun in Nevada. Today, we are going to Valley of Fire State Park. It looks pretty interesting. Maybe I'll post some more pictures after we go. 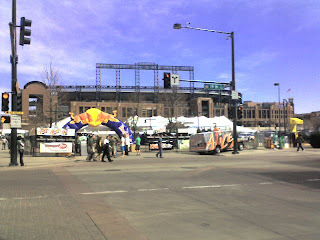 Lodo bars are packed with green clothed people today. It being Tuesday and the fact that there is no way that many companies give St. Pat's day as a holiday leads me to believe that all these Irish people are unemployed. Poor Irish forced to sit around all day drinking beers. Here it is March already. I am not sure what happened to the winter. It seems we have had many more 50+ days than not this year. Hopefully we will get some snow in March and April. Tyler's birthday is coming up. His party is this Saturday and the actual birthday is on the 10th. He is getting so big! His last basketball game for the season was this past Saturday. He is a head taller than most of the kids. He is at least 3 inches taller than the second tallest kid in the 5-6 year old basketball program. My baby is growing up. I think I am obsessed with home brewing. I wake up thinking about beer. I spend hours reading about brewing on the Internet or books from the library. I bottled my Maple beer on Saturday and started some raspberry beer Sunday morning before anyone was up. I do not even like raspberry beer! Last Friday I made a trip to my Local Home Brew Shop and bought some DME. I am now looking at refrigerators everywhere I go because I need more storage space for conditioning my brews. I think about buying more equipment all the time. Where does this all stop? Yesterday, I went on a bike ride with a facebook friend whom I knew in high school and whom I have not seen in over 20 years. He is in a wheelchair now and he took me hand cycling. Downhill was a blast. Uphill was torture. All in all, I had fun. It was a great workout and I hope to get out with him some more. Hopefully he doesn't get sick of me slowing him down! If I get to the point where I am respectable, my arms and shoulders will probably be just huge. Anyway, that maple beer I bottled was really good when I sampled it before bottling. I might taste it along with my 1776 ale on St. Pattrick's day. This coming weekend I will bottle Eric's Red. I think I may even give it a try on the 17th, even though that will be a real short conditioning period. I need to decide what to brew next. My plan for the raspberry beer is to try it with Tracy on Mother's Day. That is such a long time to wait, so we might have to break down before then. I really hope Tracy likes it because I do not know if I would be able to finish 2 gallons of fruit beer. I need that bigger refrigerator! Thanks for the obsession, Tera.